A pop-up event turned an ordinary alley in Normal Heights into an engaging public space. All photos courtesy Alleys in Action. Imagine an alley. If what you’re picturing is a drab and narrow passageway, lined with garbage bins and cars, maybe pocked with puddles and potholes, you’re not alone. Alleys are some of our city’s most neglected public spaces—but they don’t have to be. 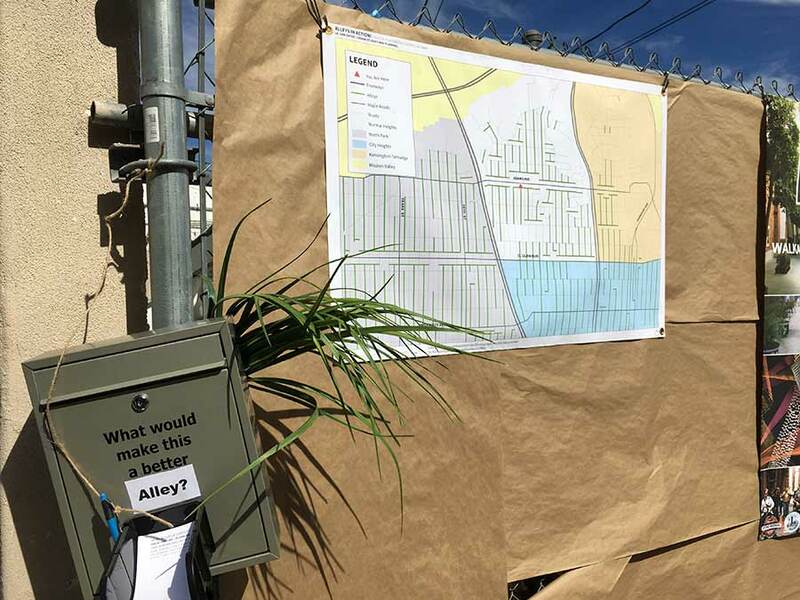 Students from UC San Diego’s Urban Studies and Planning Program, led by faculty member Sue Peerson, are working hard to transform our attitudes about alleys. Alleys, they say, can help make our urban environments greener, friendlier and more connected. 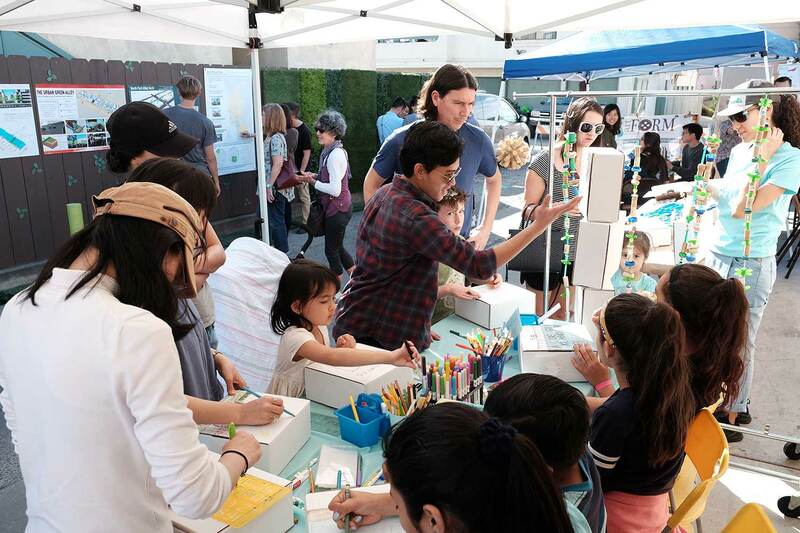 To test their ideas and demonstrate the possibilities of sustainable design, they closed off a portion of an alley in the Normal Heights neighborhood of San Diego on Saturday and invited people in. 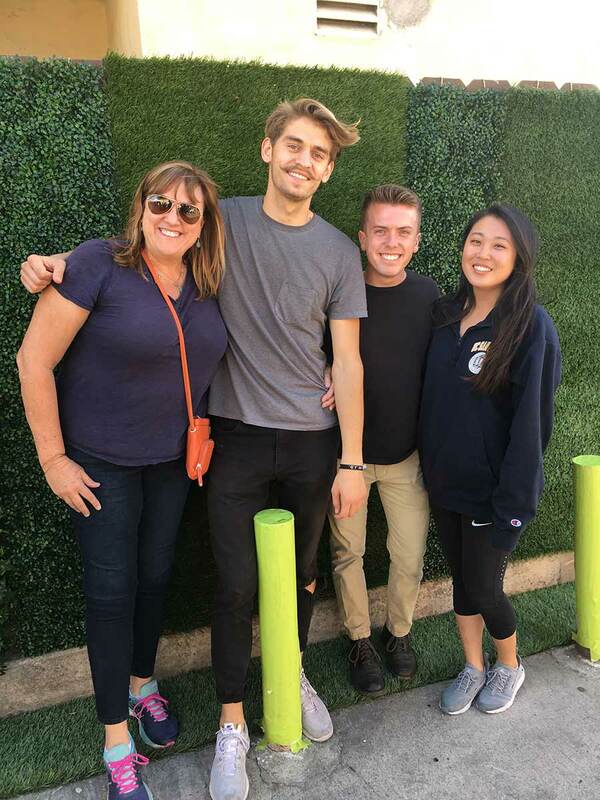 The team on a mission to “take back our alleys” in front of a green wall that can both cut visual blight and help soak up heat and carbon: Urban Studies and Planning faculty member Sue Peerson and seniors Dmitriy Goncharuk, Vincent Page and Joyce Lee. The “Alleys in Action” pop-up event was organized by Urban Studies seniors Vincent Page, Joyce Lee and Dmitriy Goncharuk. For an afternoon, they changed the nondescript alley behind the Ould Sod and Rabbit Hole bars, just south of Adams Avenue between 34th and Felton, into a people-friendly place abuzz with activity and inspiration. Working with a crew of volunteers, they painted bright blue, green and yellow squares straight onto the road. They covered the alley’s rusty bollards (the waist-high vertical posts meant to stop a car from driving into things) in leaf-green masking tape, turning the eyesores into art. These were simple pops of color but they packed a punch. The alley’s southern fence, hung with recycled astroturf and other faux plants, showcased what you might do with a green wall. Green walls help residents have more privacy. They can also help soak up carbon from the atmosphere and reduce the heat island effect from pavements. Plants are prettier to look at, too. Over and again, visitors to the pop-up stopped to take portraits and selfies at the green wall. Next to the green wall: A poster championing trees for the alley and permeable pavers, which allow storm water to soak into the ground rather than run off into drains and ultimately the ocean, as well as a map of the city’s alleys, created by Peerson and her students. There are a surprising number of alleys in San Diego, concentrated in the city’s older neighborhoods and representing a sea of opportunity. The rest of the length of the fence was hung with posters from Peerson’s Urban Design Studio, Winter 2017 edition. That class, which focused on San Diego alleys and challenged students to re-imagine them, is where the Alleys in Action project started. 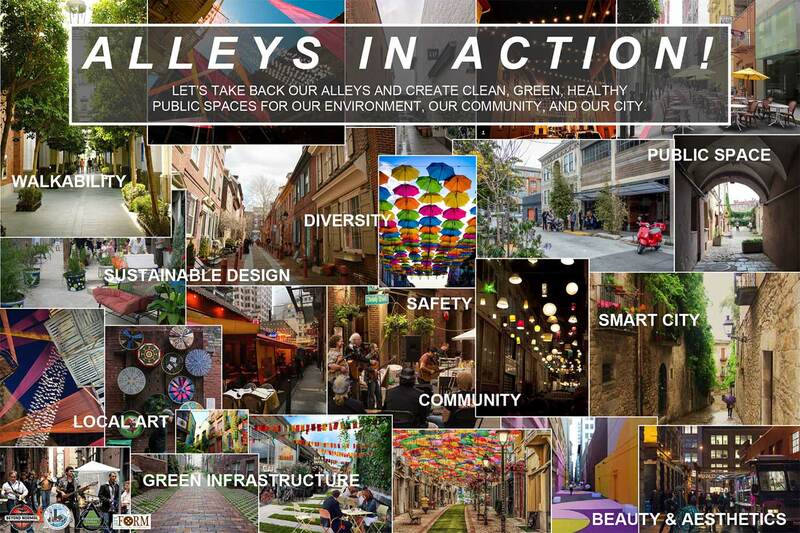 Many cities have found creative solutions to make alleys better for people–and our environment. For the pop-up, Goncharuk created a banner showcasing how other cities have transformed their alleys, making them inviting and safe spaces, artful and green. Community input and buy-in are key to transforming alleys throughout San Diego. Peerson, who is also vice chair of the San Diego Planning Commission, is hopeful that San Diego will be able to do the same. In August of 2017, the commission recommended City Council approve amendments to city codes to add new “place-making” regulations, which Peerson believes will enhance economic development, walkability, green infrastructure, and safety. On their way to be heard by City Council, the amendments would simplify the approval process and dramatically reduce permitting costs for residents to turn empty and underused spaces on public and private property into “places,” by enhancing them with murals, for example, or decorative lighting, or turning them into pedestrian plazas for events. The same regulations could help residents transform alleys too. Page has come to the conclusion that the only way to do it is to work with business associations like the Adams Avenue Business Association, which partnered with USP to plan and organize the pop-up in Normal Heights and may become involved in future alley improvements in the area as well. The AABA, he said, understands not only the civic benefits of a transformed alley but the economic ones as well. “Business associations also have the networks and the funds,” Page said, to turn creative visions into reality. In addition to the AABA, the Alleys in Action project also partnered with ArtFORM, an arts education nonprofit that specializes in the reuse of materials and diverting them from landfills. ArtFORM, which is located on Adams, a block from the pop-up, worked with local third-graders from Normal Heights Elementary prior to the event. The young students made connections that taking care of alleys and improving them directly correlates to climate change and clean oceans. And what would you want to see in your alley? At the pop-up, ArtFORMset up several art activities, including a coloring station for people to re-envision the alley and its dumpsters. The artwork of both the elementary students and pop-up participants was displayed at the event. Demonstrations and public engagement were the focus of the whole team’s efforts, Peerson said. 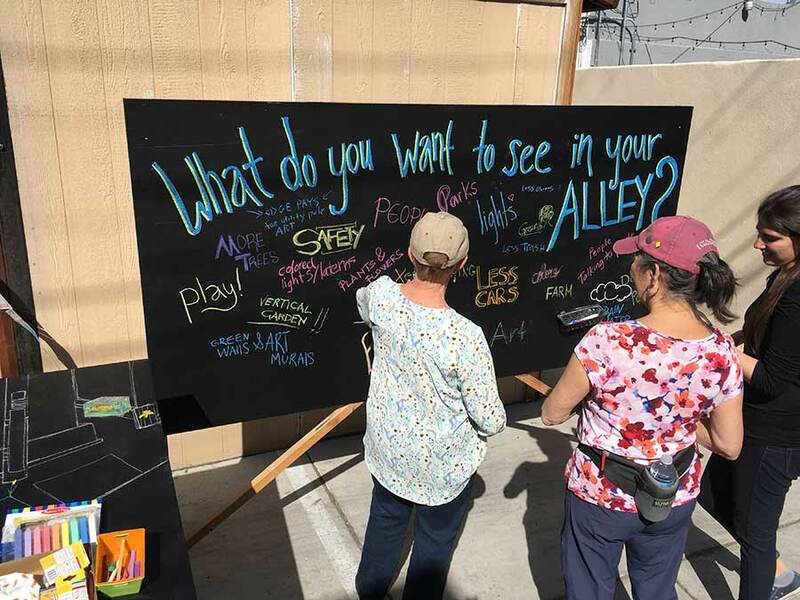 A chalkboard set-up asking the question “What do you want to see in your alley?” drew a number of varying responses: from the sardonic “cats” to the earnest “more trees,” “rainwater harvesting,” “less cars,” “places to sit” and “people talking to people. Suggestion boxes were also posted to solicit community input.